Last week I had a visitor from England–Heath Woodward, who I met three years ago because he was writing a musical about Peg Entwistle. Last year I visited Heath’s hometown of Margate, where I saw an early showcase of “Goodnight September” (which recently had its first performances there); this year it was his turn to visit Los Angeles. Because Heath’s previous visit was short and lacking in both a car and a guide, I was determined to show him more of the city, and I think I succeeded. In addition to Hollywood and Beverly Hills, I took him on a tour of downtown that included the Broadway theaters as well as the Belasco, where Peg Entwistle had great success starring in “The Mad Hopes” in 1932. 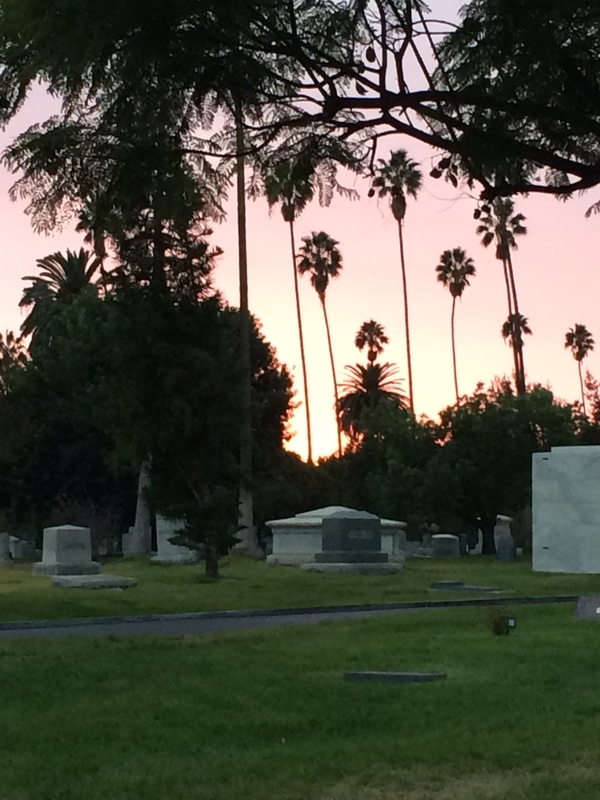 Last Tuesday we went to Hollywood Forever, my favorite cemetery. 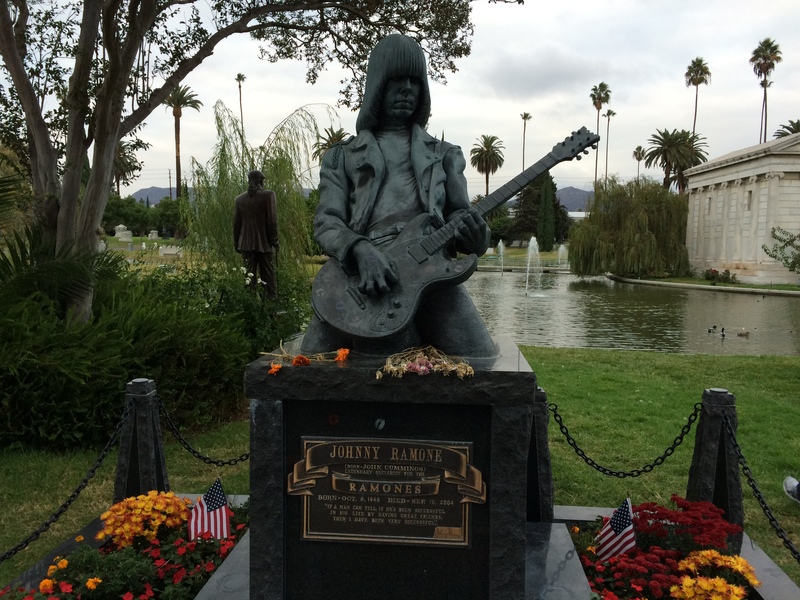 It was an appropriately overcast day, and as we wandered through the Garden of Legends I realized that–with the exception of a screening of “Chinatown” and a Johnny Marr concert, both held at night–I hadn’t been there in twelve years. 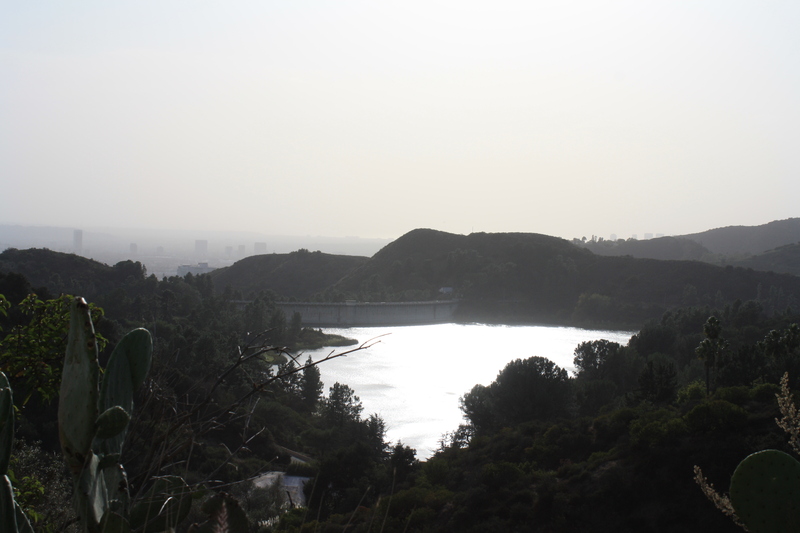 (Last time I was showing it to a friend from Hawaii; he said it was his favorite place in LA because he couldn’t hear the sound of traffic.) 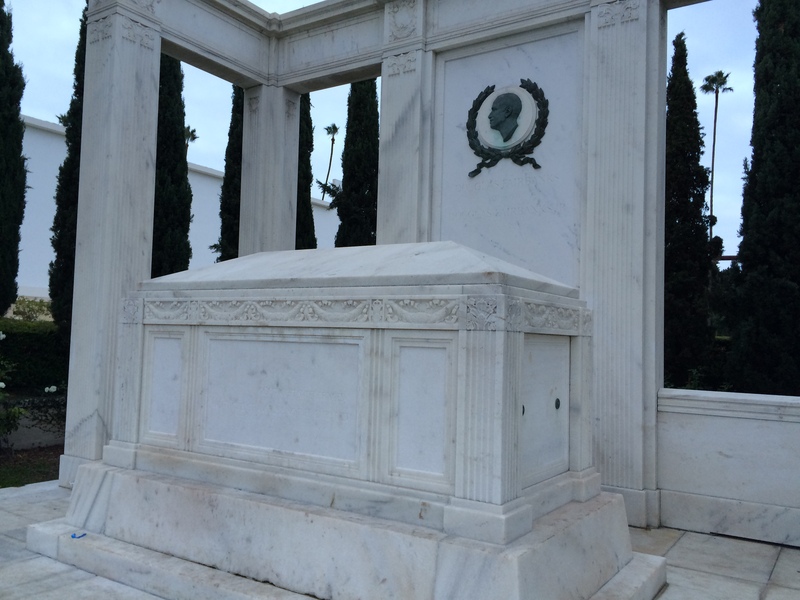 Although it was late afternoon when Heath and I arrived, we managed to see some of the highlights–the Fairbanks, Tyrone Power, Jr., and DeMille memorials–but not the Valentino crypt, as the mausoleum is being worked on and was locked. 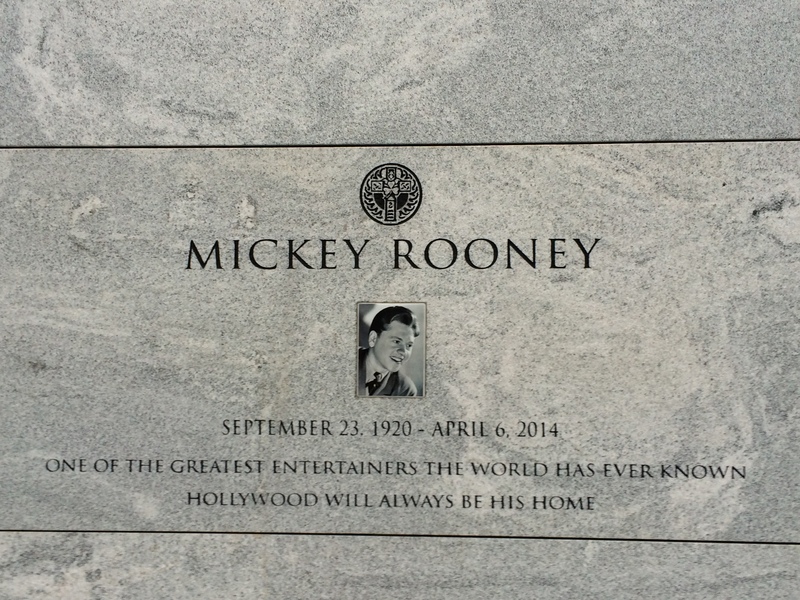 But its outside wall featured a new addition–a stone for Mickey Rooney, who died earlier this year. 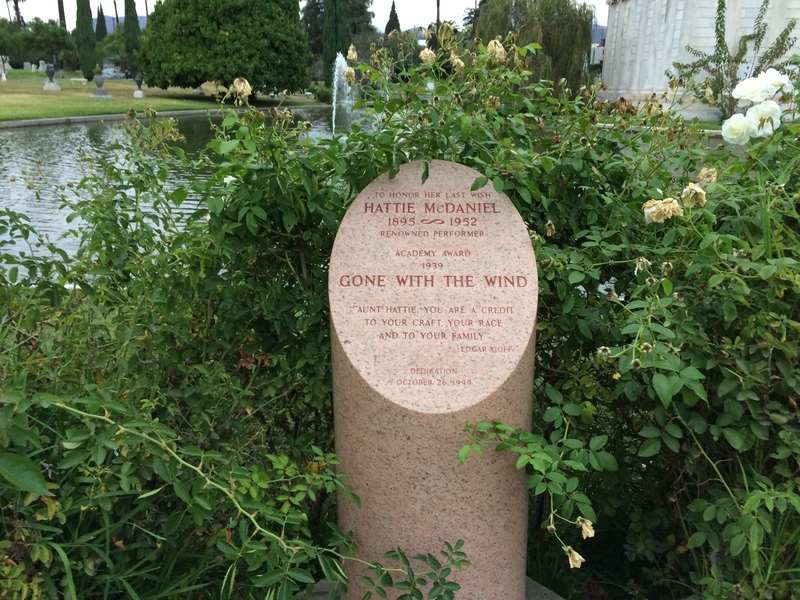 Nearby stood Johnny Ramone’s statue and Hattie McDaniel’s pink oblong stone. 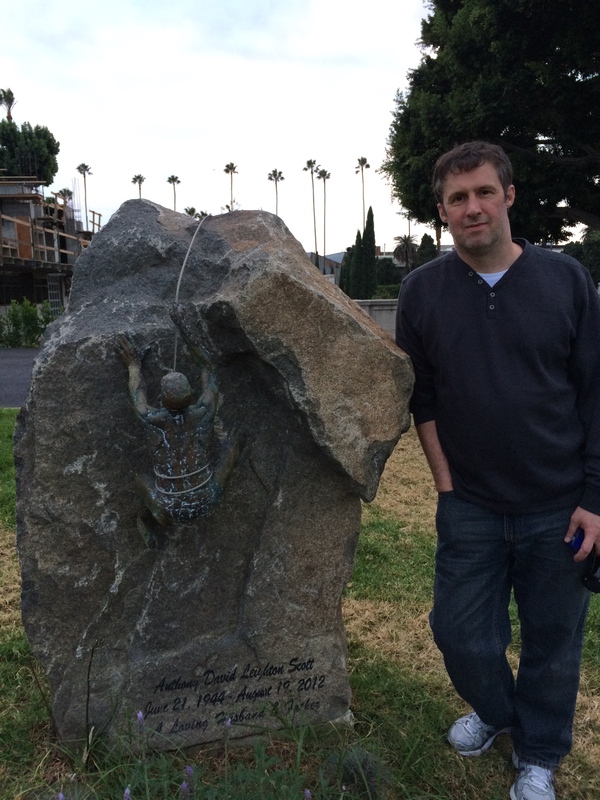 One headstone caught our eye simply because it was unlike any memorial we’d ever seen–a sculpture of a man lashed with steel cable to a jagged rock. 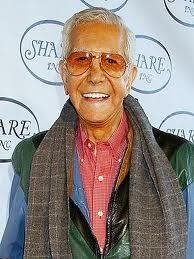 Staring at the inscription, we were startled to realize that it was Tony Scott’s grave. By then it was getting dark, so my efforts to pay respects to John Huston, whose excellent autobiography An Open Book I’m reading, had to be postponed. Along the way we had picked up a couple of fellow travelers–a woman and her live wire four-year-old son. The little boy grabbed my sleeve, showed me his blankie and attached himself to our self-guided tour, saying “We need more people!” Unlike us, he didn’t mean dead ones. 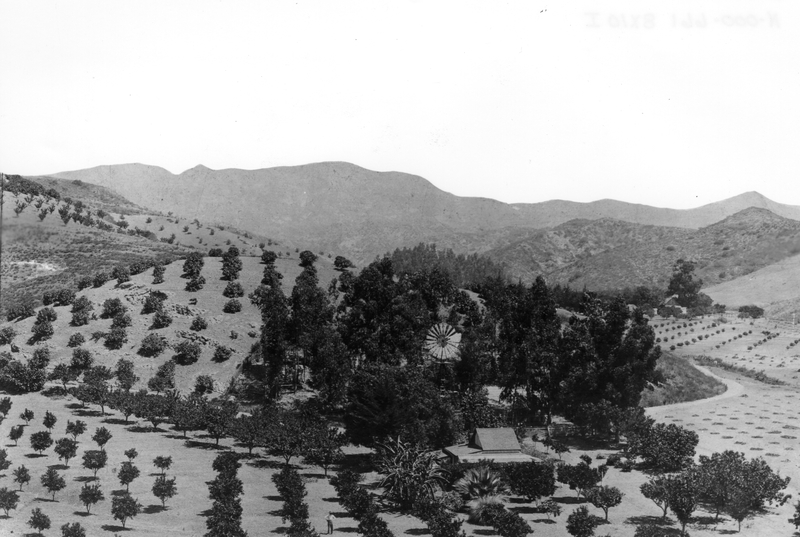 The Fairbanks Memorial, burial place of Douglas Sr. and Jr.
You are currently browsing the Silent Era category at Under the Hollywood Sign.